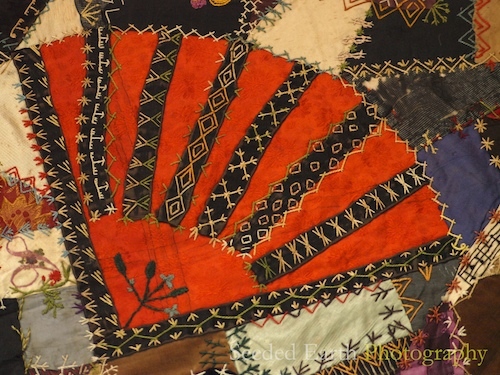 Sarah was born in 1866; she sewed and painted this coverlet c. 1884. She lived on a farm in Clark County, Missouri, near the town of Kahoka, where her older sister and brother-in-law had a millinery shop. Her sister brought home the scraps from her shop, and shared them with her younger sisters. 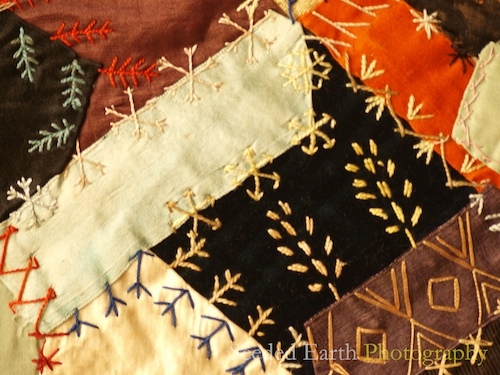 Most evenings, after the farm chores were done, Sarah and her sisters would all gather and each would sew or decorate their “comforts” or other pieced items. Since the girls were using scraps from a well-established and profitable shop, they had access to the finest of materials. Silks, damasks, moires, chintze, brocades, velvets, and fine cottons were all available for their use. Sarah did several appliques on this piece. The most elaborate was this orange fan. Sarah evidently had some talent in the arts. She was the only girl in the family who actually painted on her fabric. Most of the small paintings are of the more common varieties of flowers–daisies, violets, wild roses–but she also painted several butterflies and this swan. The quilt is done in mostly browns, neutrals, and oranges. The one thing I find amazing is the border Sarah added to her handiwork–a five inch wide swath of bright pink chintz. The fabric has suffered from lots of use and improper storage. 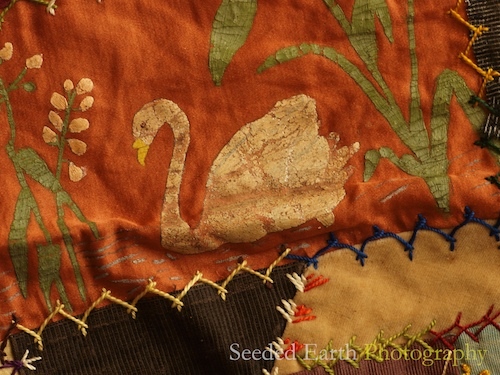 There are quite a few worn pieces of fabric in the delicate materials. Nonetheless, I consider this one of my family’s heirlooms. Definitely wabi-sabi. The entire set of photographs, including more close-ups of different sections of the coverlet are in this flickr set. This post has soooo many wonderful aspects to it; the family heirloom, the beautiful hand work; the nice photography that helps tell the story. Thank you so much for sharing this. The quilt is beautiful Bo, especially the hand painted area. What wondrous expressions of creativity that are being lost in our age of technology. This is beautiful. I like keeping items that have a history. Nice pictures. 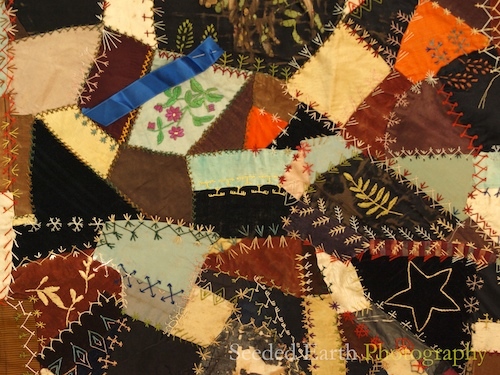 Beautiful quilt, fine photography as well. This is fantastic! Not only in its workmanship..which is incredible all unto itself..but that you’ve saved and preserved it for all these years. Yes – definitely wabi sabi. you should consider sending a complete set of the quilt to some historic society or local museum for posterity. Wonderful story and images. The talent of your greatgrandmother certainly made its way down to you. I’m so glad you shared this. If I were rich, very rich, a few things I would do- is keep an enormous aquarium with cuttlefish, and then I’d start a quilt collection. Some of them would be fabulous displays of stunning workmanship, elaborate piecings, picture quilts, and some would just be full of history and character and love. This samples from the spectrum. Bo you have done a wonderful job of capturing the work of your great-grandmother – I love the story you included with the pictures, bringing it all to life. How fun to have her diary, and this precious comfort to go along with it!